In The Mysterious Collapse of World Trade Center 7: Why the Final Official Report about 9/11is Unscientific and False, David Ray Griffin provides an overwhelmingly convincing case that the latest official US government account of the events at “Ground Zero” on September 11, 2001 , is false. He examines in detail the whole series of publications by the National Institute of Standards and Technology (NIST) purporting to explain the highly “mysterious” collapse of World Trade Center 7, a 47-story steel-framed skyscraper across the street from the North Tower, which was not struck by a plane and yet collapsed into its footprint, at nearly free-fall speed, shortly after 5 PM that day. That the sudden collapse of Building 7 constitutes a “mystery” is an admission of the major media and NIST itself, which for years said it was having a hard time understanding what had occurred. After a long series of preliminary attempts, admitting that a full explanation had not been achieved, NIST issued its “Final Report” in November 2008, claiming to present a scientifically-verified and complete account of the causes of the building’s collapse. As critics of the ever-changing official explanations point out, however, the “mystery” is the result of failure by government and media to consider the most likely explanation, one that accords with a vast amount of physical and testimonial evidence, which is that the building was brought down by controlled demolition. In the Introduction, Griffin lays out the background to NIST’s “Final Report,” surveying the agency’s earlier “interim” reports and the evolution of its attempts to explain the “mystery.” In its “Final Report,” NIST abandoned its earlier claim that structural damage from debris from the North Tower was a significant cause of Building 7’s collapse, asserting that the principal cause was very hot and long-lasting fires of office materials in the building set ablaze by the falling debris. In Chapter 1, “NIST as a Political, Not a Scientific, Agency,” Griffin shows that NIST, as an agency of the Commerce Department, was under tight political control by the Bush administration. He quotes from a whistleblower from the agency who described in detail how political appointees in the “front office” vetted every scientific statement issued by NIST, and how the statements were then vetted by “the HQ staff of the Department of Commerce,” the National Security Agency and the Office of Management and Budget. In Chapter 2, “Some Principles of Scientific Method,” Griffin begins by considering what constitutes scientific fraud, and then distinguishes between scientific fraud in the strict sense and in a broader sense. Scientific fraud in the strict sense has been committed by NIST if it can be shown that i) the agency has fabricated evidence to support its claims; ii) that it has falsified evidence; or iii) that it has ignored relevant evidence. Scientific fraud in the broader sense has been committed by NIST if it can be shown that it violated further scientific principles, including these: extra-scientific considerations should not be allowed to determine conclusions; an investigation should begin with the most-likely hypothesis; straw-man arguments should be avoided; unprecedented causes should not, without good reasons, be posited to explain familiar occurrences; and scientists should not make claims implying that laws of nature have been violated. In Chapter 3, “NIST’s Refusal to Begin with the Most Likely Hypothesis,” Griffin establishes that the most likely hypothesis to consider in attempting to explain the collapse of WTC 7 must be that it was brought down by controlled demolition using explosives, for two reasons. First, no steel-framed skyscraper prior to 9/11 had ever collapsed for any reason other than demolition; on 9/11, however, and in one small area, three such buildings came down, purportedly due to fires, and in the case of the Twin Towers, additional damage caused by airliner impacts. (In his earlier book, Debunking 9/11 Debunking, Griffin has already demonstrated that NIST’s “explanation” for the disintegration and fall of the towers does not stand up to rational scrutiny.) Second, the collapse of WTC 7 “exemplified many of the signature features of the type of controlled demolition known as implosion”: the collapse started from the bottom and was sudden and total, the building came straight down and fell at close to free-fall speed, its concrete was pulverized to dust, and the debris pile was relatively small (p. 27). When fires result in “high-order damage,” evidenced by shattered structures, pulverized debris, and significant lateral ejections of material, guidelines established by the National Fire Protection Association in its “Guide for Fire and Explosion Investigations” mandate official agencies to investigate the possibility of explosives, but NIST never undertook any such investigation. 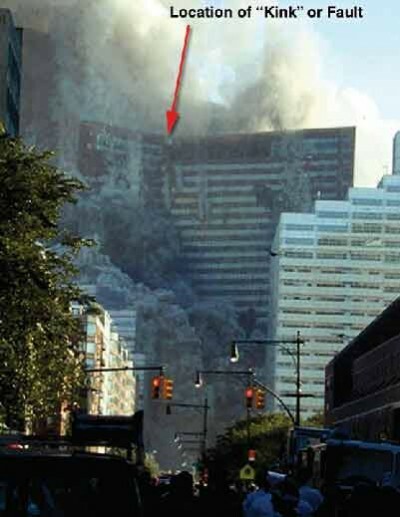 In Chapter 4, “NIST’s Ignoring of Physical Evidence for Explosives,” Griffin lays out the physical evidence suggesting that the building was brought down by controlled demolition: video evidence of “squibs” of smoke and pulverized material blown laterally out of the building as it collapsed; a vertical row of blown-out windows from the 29th to the 37th floors, unexplainable by NIST’s account; molten metal in the debris under the building; an array of scientific reports of extremely high temperatures, far above the temperatures which could be reached by fires burning in office materials, as proposed by NIST; thinning and sulfidation of steel recovered from the building; extreme heat and unusual emissions at the collapse site for months afterwards; and red/gray chips found in dust from the building’s collapse, which on analysis by independent researchers Steven Jones, Kevin Ryan, Niels Harrit, and others, proved to be nanothermitic, derived from a very advanced type of explosive. NIST in its “Final Report” failed to take any of this evidence into account, simply pretending it did not exist. In Chapter 5, “NIST’s Ignoring of Testimonial Evidence for Explosives,” Griffin first reviews NIST’s prior ignoring of testimonial evidence for explosions in the Twin Towers before their disintegration. He then presents in detail a wide array of testimonial evidence supporting the most-likely hypothesis, implosion. These testimonies came from credible witnesses, including a New York Daily News reporter and a New York Police Department officer located outside the building before it came down, who heard explosions inside it; detailed accounts from two high-level NYC employees, Barry Jennings and Michael Hess, of their experiences inside the building that morning, where they heard and felt large explosions before the Twin Towers had collapsed; testimonies, again from highly credible witnesses, to foreknowledge of the building’s collapse; premature television reports that the building had come down, before it had actually collapsed; and even witnesses to Fire Department of New York personnel announcing that the building was going to be “brought down.” Griffin shows that NIST either ignored this evidence or went to great lengths to distort it by constructing an elaborate false chronology of the testimonial evidence which it could not simply ignore. In Chapter 6, “NIST’s Straw-Man Arguments against Explosives,” Griffin analyzes the reasons presented by NIST for its refusal to investigate the possibility that explosives were responsible for WTC 7’s destruction. He shows that they employed “straw-man” arguments based on highly-implausible scenarios for the types and quantities of explosives used and then argued that these scenarios are … implausible! The principal scenario NIST focused on, needless to say, was not one that has been proposed by any actual independent researchers as a plausible one. Griffin then shows that high-level personnel at NIST, including four directors from 2001 to 2008 as well as key advisors to the agency, had extensive professional involvement with and expertise in the technology of nanothermitic materials, the very type of explosive proposed by independent researchers as most likely to have been used on 9/11. Indeed, as Griffin details, NIST is engaged in partnerships with academic and federal government research units around the country to develop nanothermitic technologies. In Part II, “NIST’s Unscientific Arguments for Its Own Theory,” Griffin dissects the arguments made by the agency in putting its own “explanation” forward. He shows in detail the failure of the authors of the “Final Report” to adhere to standard scientific principles, including their failure to base their analysis on empirical facts and physical tests (preferring “black box” computer models in which any parameter can be tweaked until the desired result is obtained), their distorting of data or fabrication of “data,” and their failure to eliminate glaring internal contradictions within their arguments. In Chapter 7, “NIST’s Theory of an Unprecedented Collapse: an Overview,” Griffin provides an overview of the complex theory promulgated by NIST. He first explores NIST’s claim that the collapse of the building was unprecedented. NIST makes this claim implicitly in advancing its own candidate for the principal causal mechanism, thermal expansion of steel from office-materials fires. Because there is no known prior case in which thermal expansion of steel caused a steel-framed skyscraper to collapse, but there are many cases of implosion of such buildings, NIST’s proposal raises the question whether it violated the scientific principle to avoid invoking unprecedented causes to explain familiar occurrences. Then Griffin surveys the major features of the NIST “explanation” to orient the reader for the detailed discussion in following chapters. In Chapter 8, “The Initiation and Spread of Fires: NIST’s Unempirical Account,” Griffin examines closely NIST’s claim that the fires in WTC 7 started as a result of the rain of debris which hit the building when the North Tower disintegrated and fell. He shows that NIST’s claims that fires in the building started at this time ( 10:28 AM ) are unsubstantiated, and that the fires therefore could not have burned for as long as NIST contended they did. He points out that NIST itself admitted that most of the fires in the building may have started quite a bit later in the day, in the middle and late afternoon, and thus have burned for less than three hours and even as little as 40 minutes. In Chapter 9, “Fire and Steel Temperatures: Implausible Claims Based on Distorted Data,” Griffin shows that NIST’s claims regarding the temperatures reached by the fires themselves and the steel structure of the building exposed to those fires are both wildly exaggerated. This extreme overestimation was made possible by the use of computer models, which were manipulated by NIST “investigators” to achieve the desired result (the agency had used the same method in its earlier reports on the destruction of the Twin Towers ). There is in fact no evidence to support the fire temperatures or the fire durations claimed by NIST. In a similar manner, NIST “simulated” the temperatures reached by the steel structure of the building, and claimed wildly implausible temperatures for which there is no actual evidence, based on the assumption (contrary to fact) that steel has no thermal conductivity! In Chapter 10, “From Thermal Expansion to Global Collapse: Fabrications and Contradictions,” Griffin shreds the last pillar of NIST’s account: its claim that thermal expansion of steel floor beams and girders caused “global collapse.” He shows that this claim is based on highly implausible assumptions, outright fabrications, denial of the existence of structural elements that did in fact exist, and fabrication of a “differential thermal expansion” result from its computer simulations by modeling heating of the steel beams but not of the floor slabs! Griffin delivers the coup de grace by showing that NIST was forced to admit that WTC 7 did indeed fall at free-fall speed for more than two seconds during its collapse, which would only be possible if all resistance to the fall had been eliminated by removal of the lower portion of the building by explosives. This demonstrates that NIST has resorted to a miraculous “explanation” of the collapse of Building 7, in which no explosives were used and yet free-fall still occurred, and has thus violated the scientific principles of non-contradiction and impermissibility of claims implying that laws of nature have been violated. In the “Conclusion,” Griffin summarizes the many ways in which standard principles of scientific investigation were violated by NIST in its “Final Report.” On this basis, he concludes that the Report is false, and then discusses the implications of this fact. The only possible conclusion is that WTC 7 was demolished “by domestic terrorists with the ability to plant explosives in it and then to orchestrate a cover-up” (p. 255). If this is true of Building 7, it must be true as well of the Twin Towers . When these conclusions are drawn, it is clear that the entire basis and pretext for the ongoing war in Afghanistan (and now Pakistan ) is false. Muslims did not bring down these buildings. The events of 9/11 were quite simply the largest, most heinous false-flag operation of all time. The Mysterious Collapse of World Trade Center 7 by David Ray Griffin is an epoch-making book, of tremendous importance for our future. Griffin has shone a spotlight on the Achilles’ heel of the US government’s account of 9/11. NIST’s failure to defend the official story of the collapse of WTC 7 lays bare the weak spot that will make it possible for us to bring this monster down and stop the wars of aggression abroad and the growing police-state at home. You owe it to your country and the world to read this book.